If you're on a Managed Award Template in Tanda, you might have classified staff when you first setup your account, otherwise you might have done this through bulk categorise tool. You can also categorise staff on their Profile through the Payroll tab. This is used to identify a staff member when you are working with certain accounting packages. Systems such as Xero and MYOB should show the linked profile name below the Employee ID. If it shows the wrong employee, check the name spelling and email address on the Personal tab in Tanda with the information in your Payroll system. Set from when you imported your staff or can be manually assigned. It's important to have both set for correct rates from the award and also for keeping a track of staff anniversaries with your business. This feeds through to the Birthday calendar. This should be 0 if you are on Tanda Managed Award Template and want to pay the employee according to the award level selected. If you pay higher than the Award or have Custom Rules built into Tanda, set the employee's base rate in the field and it will block Tanda from sending any rate information to your Payroll & Accounting system. Set Salaried staff Annual Salary less Super for costing and reporting in Tanda. Have a further read of how Salaried staff use Tanda in the following article. If you are on a Tanda Managed Award Template, you will select and configure this information to the right of the profile (including Base Rate Add-ons and Allowances/Penalties). 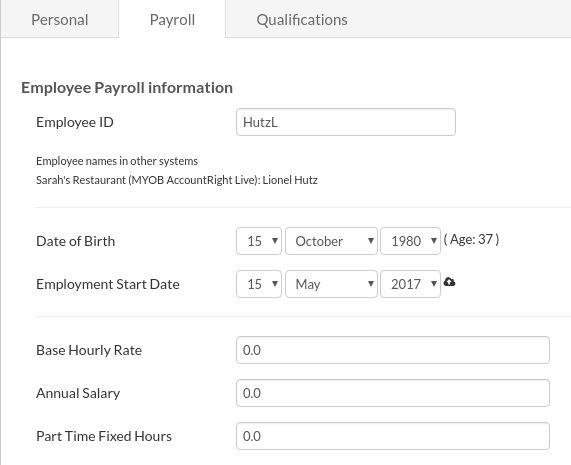 At this point if you click Update Employee Details at the bottom, when the page refreshes it will populate the breakdown of the employee's pay rate. Confirms the Public Holiday settings applied to the employee. This is configured in the General Settings or within the Team if different to the account default. There are a number of fields that are hidden by default on the employee profile page relating to Payroll. You can enable these through the Advanced Payroll Power-up. Part Time Fixed Hours: if your staff member is part time, this is where you enter what their contracted hours are, either weekly or fortnightly. That way, the system knows when to calculate overtime. Expected hours in a week: enter expected hours for salaried staff, to cost their hours on timesheets and reports. This can also be configured in Salary Settings. Overtime averaging period: if you are setup for a weekly pay (for example), but you have a staff member whose overtime is calculated fortnightly, you can set this in their profile and then build award rules specific to them. Period start date: this is important for overtime averaging. Set the start date from when you would like overtime to be created. 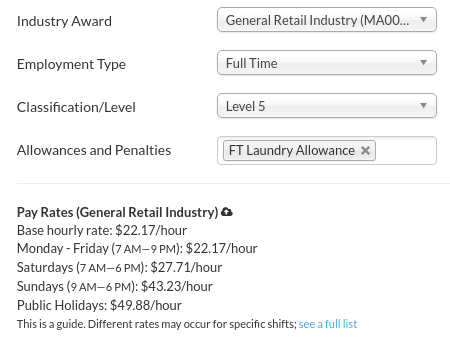 If you’re employees are paid weekly, however their overtime needs to be averaged over 4-weekly blocks, you can use this field to set the start date of these 4-weekly blocks.